St. Pius X was born Joseph Sarto to a poor village shoemaker and was the oldest of eight. Joseph was ordained with the help of two parish priests and was made assistant to the pastor in a small Italian mountain village. Fr. Sarto was kind and his soul was on fire for God. Fr. Sarto loved to preach about the Blessed Sacrament. Fr. 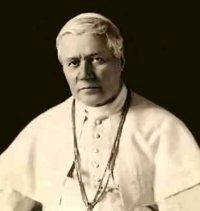 Sarto eventually became Bishop of Mantua and in 1903 was elected Pope and took the name of Pius X. Pope Pius X helped make the Holy Communion become more frequent and reduced the age of when could make their first Holy Communion.